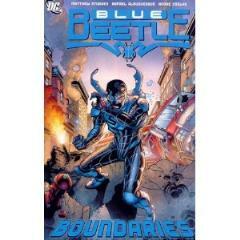 Growing up a teenager in the west Texas heat can be tough, especially for Jaime Reyes--the stellar, armor-wielding superhero known as Blue Beetle! As if balancing homework with having a power-granting, extraterrestrial scarab welded to his spine weren't enough, now Jaime faces the arrival of a mysterious group of men sporting super-abilities as they try illegally crossing the Mexican border. And as the protector of both El Paso and Ciudad Juarez, that means double trouble for the teen hero!